Sunrisers Hyderabad recorded their first win this season at home as they routed the Kolkata Knight Riders in a rain hit encounter at Vizag. Coming into the match after losing two games on the trot, David Warner guided the way to the victory for the Risers with the bat, while it was a show of the Kumars with the ball. Gambhir & Co. winning the toss, elected to bowl first in somewhat overcast conditions at Vishakhapatnam, as the flood lights were put to use since the very beginning due to the cloud cover. The new addition to the Knight Riders side, Johan Botha initiated the proceedings for his side while it was the so far successful pair of Warner and Dhawan opening for the Men in Orange. 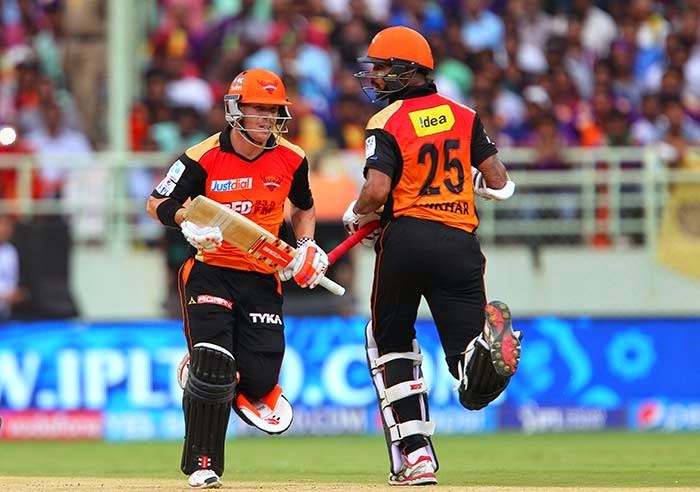 Senior pros David Warner and Shikhar Dhawan gave a steady and much needed stable start to the Sunrisers, periodically rotating the strike and punishing the loose deliveries and the ones in their area, and this brought them to a decent score of 56-0 at the close of 8 overs of play. It was then that skipper Warner decide to go after the bowling and made a shift in the gears with Shikhar supporting him well on the other end. Half-century for David Warner came up in the 10th over off just 36 balls, but the actual visual batting treat was yet to come. He charged upon the bowlers and restricted the Knight Riders from savouring success anytime in the innings till the 15th over, when he hit a ball high up in the air off Morkel which was completed by a good calm catch by keeper Uthappa. He played a magnificent innings of 91 out of just 55 deliveries hitting four mammoth sixers and as many as nine fours. He did his job setting up the platform for the final carnage, with a score of 130-1 and five more overs to go. One would expect a score of 190+ but the run rate unwantingly for the Risers deflated. The ploy to push Bopara up the order failed as he departed for just 2 runs. Dhawan who was expected play the role of the aggressor satisfied it to some extent but collapsed in the 18th over scoring a well placed 54 off 46 balls. At the close of 20 overs the Sunrisers Hyderabad ended up amassing 176 runs, some 20 runs short after the initial flyer Warner took then to. More Morkel was the most successful bowler for the Knights giving away just 31 runs in his 4 overs in just a couple of overs. Rain was on the cards, and it did play a spoil sport in the match in the innings break. As per the revised conditions according to the D/L method, the Knights were to chase 118 runs in just 12 overs. It was a great ask starting with around 10 runs required an over and eventually the Knights succumbed to the pressure. The two openers for KKR, Gambhir and Uthappa looked quite contrasting in the middle. While Robin was attacking and clearing the boundary from the word go, Gautam was surviving dangerously being dropping twice. He ultimately departed after being cleaned bowled by Praveen Kumar in the 4th over. The Knights further wobbled as Robin who looked threatening followed his skipper back to the pavilion in the 6th over. who ended up winning by 16 runs according to the D/L method. Winning this match will boost up the confidence of the SRH camp to great levels, while KKR will be keen to bounce back after rain ruined their fortunes this match. The Knights play Rajasthan next at home while SRH pay vist to the Mumbai Indians later this week. 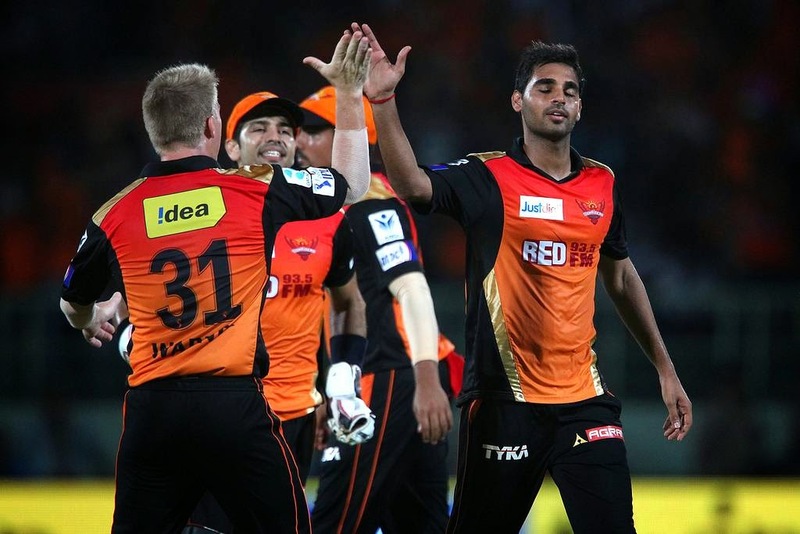 Sunrisers bounce back in style in a rain hit match at Vizag.